Manufacturing, Trading, Importer and Exporter of Magnets and Magnetic Equipment. We, Jai-Mag Industries embarked on our glorious and ambitious journey in the year 2005. Since then we are manufacturing permanent magnets and magnetic equipment. Our range is produced as per the standards of the industry and is climbing new domains with every passing day; this has also assisted us in remaining way ahead of our competitors. Based in Surat, our range of magnetic product is widely used in Liquid Filtration, Mining, Steel Foundries, Chemicals, Food and Plastic industry. Equipped with the requisite state of the art machines and tools, we offer our range in a wide assortment of standard size. Apart from this, we also have expertise in customization as per the specifications of our valued customers. Under the guidance of our founder Mr. Vijay Mehta, who has ample experience of the trade, with every passing day, we are climbing new ladders of success. We are manufacturers of a wide range of permanent magnets and magnetic equipment . These are produced by using qualitative raw material and conform to the existing standards of the industry. Employment of innovative technology has assisted us in the fabrication of unmatched range of our equipment which is widely used in a wide range of industry including Steel Foundries, Chemicals, Food, Plastic, Liquid Filtration and Mining. Our endeavor to understand the need of our valued customers has helped us in offering the facility of customization as per their requirements. We employ modern machines and tools in the fabrication of permanent magnets and magnetic equipment. Our range is manufactured by using qualitative raw material which is sourced from trustworthy vendors. This helps us in the production of unmatched range which is well acclaimed in the industry circle for its sturdy construction and performance. Apart from this we also follow stringent quality standards. 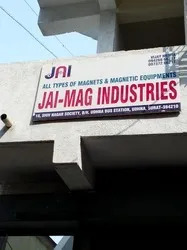 To keep abreast with the technological developments taking place in magnet industry and incorporate them in our range of product, we have a team of skilled professionals, who have expertise in their respective domain. Our team comprises designers, engineers, fitters, quality analysts and other technicians, these professionals work sincerely to manufacture unmatched range of product. Our quality analysts systematically scrutinize the complete process right from the start to the finalization of the product and leave no space for any sort of defect. Our endeavor to offer unmatched range of product along with timely delivery has helped us in creating a wide customer base not only in India but all over the world. To address feedback received from our esteemed customers, we have a well organized customer care cell that concentrates on a wide range of issues. Such measures have helped us in creating a wide customer base all over the world. Apart from manufacturing standard range, we also offer our valued customers the facility of customization and free sampling. Terms and conditions related to lead time, minimum order, mode of payment and others can be negotiated at the time of placing of order.